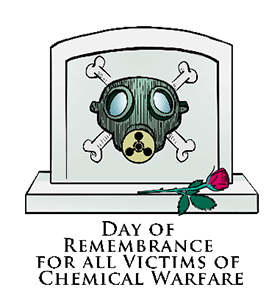 ﻿Day of Remembrance for all Victims of Chemical Warfare: Calendar, History, Tweets, Facts, Quotes & Activities. Day of Remembrance for all the Victims of Chemical Warfare commemorates the victims of chemical warfare and serves to reaffirm the world's commitment to eliminate chemical weapons. Thus, the day also serves to promote peace, security and multilateralism. Although, chemical weapons have been banned for some time by the Geneva Convention, they are still infrequently used. The United Nations proclaimed the Day of Remembrance for all the Victims of Chemical Warfare in November of 2005. It has since been celebrated on April 29th, the same date on which the Chemical Weapons Convention entered into force in 1997. The day aims to destroy chemical weapons and further gain adherence to the Convention's articles in order to achieve a safer and more peaceful world. Chemical weapons were used for the first time on a large scale in battle during World War I at the battle of Ypres in 1915. The chemical that was used as a weapon was chlorine gas. 90% of the world’s declared chemical weapons stockpile of 72,525 metric tones has been verifiably destroyed. 100% of the declared chemical weapons production facilities have been inactivated and all are subject to a verification regime. 3) Schedule Three: these are typically the least toxic chemicals and are used for research and the production of medicines. For the risks that the leaders of a rogue state will use nuclear, chemical or biological weapons against us or our allies is the greatest security threat we face. – Madeleine Albright, American politician and diplomat, first woman to be secretary of state. Watch a documentary or movie on the perils of chemical warfare. Some popular options are: Science at War: Laboratory of War , Chemical Warfare Watch , Avoiding Armageddon: Chemical Weapons , and Total Recall . Read a book on the widespread dangers of chemical warfare. Some good suggestions are: War of Nerves, Chemical and Biological Warfare: America’s Hidden Arsenal, and a Higher Form of Killing. Visit the site of some of the chemical weapon use. Some ideas, the Battlefields of Ypres, the Battlefields of Passchendaele and the Tokyo Subway. Donate to the Organization for the Prohibition of Chemical Weapons. They seek to end the use and existence of chemical weapons throughout the world and all proceeds help them toward that goal.